Nice survey of what people would do with their phones if they could. And do since they can. The iPhone is a beautiful device on its own, but with hundreds of millions of iPhones sold it's not particularly unique. Whether you employ a few simply tricks or more complicated alterations, it's easy to put your own custom stamp on your ordinary device. Here's how you can design custom cases, themes, icons, and more to change your iPhone both inside and out. Our phones have become our go-to devices for both work and play, but they don't always look and operate the way we like. Whether you want to change your iPhone's appearance, enhance its functionality, or both, you have plenty of options. In this post we'll be looking at customization methods for both your iPhone's software and hardware (hence, "inside and out"). As a result, we've broken it up into two sections. "The Inside" section contains information on how to change icons, create custom and specialized wallpapers, and theme your device. "The Outside" section will help you make custom cases, skins, and alter the actual materials that make up your iPhone. Read both or just skip to the one you want. The inside, or the software aspects of your iPhone, are highly customizable—probably more than you even realize. You don't even have to jailbreak your iPhone to perform many customizations (although the more complex changes do). In this section we're going to look at how you can change your home screen icons, get creative with your wallpapers, and completely change the interface as you know it. Before we get started you're going to need to download the great and free application iExplorer (works on both Windows and Mac), which will allow you to access your iPhone's file system. You'll want to have this app whether or not you're jailbroken. It's the simplest way to copy and edit files on your device. Changing your icons is very simple with iExplorer. You'll need to download existing icons in PNG format or create your own. When I'm looking for existing icons, my first stops are The Icon Factory (be sure to browse for and check out the "Flurry" sets) and deviantART. If you want to make your own, we have a guide that can help you. Once you've got your new icons it's just a matter of replacing the correct files. Once you're browsing the app's resources, you'll have a lot of files to look through. The one you want to find is generally called icon@2x.png. While the name may sometimes vary, in most cases that is the file you're seeking. Simply rename the new 512x512 pixel icon with the name icon@2x.png, delete (or backup and delete) the original icon from the app you're editing, and replace it with the new file. You'll need to repeat this process to edit all of the other icons. This will be tedious if you have a lot of apps, but it's pretty simple and doesn't require a jailbreak to work. Your wallpapers don't have to be a photo that sits behind your apps. You can make them feel like part of the interface as well. 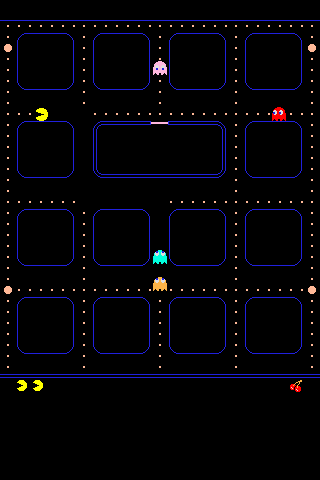 For example, you can create shelves, gridded paper (pictured to the right), and even a PacMan board. There are plenty of other options available if you want to make your home screen wallpaper serve a greater purpose. Of course, you're not limited to what others have created. You can always create your own. All you need to do is take a screenshot of your home screen (by pressing the lock and home buttons at the same time) and email that image to yourself. You can then use that as a template to create a 960x540 pixel wallpaper that will integrate nicely with your icons. If you're not feeling that ambitious but still want something a little more personalized, check out an app called Pimp Your Screen ($1). In addition to providing numerous wallpapers that integrate with your icons, it has a home screen wallpaper building function that will let you add various types of shelves to an image. This way you can create a custom look without the need to dig into Photoshop. One of the disadvantages to custom-designed wallpapers is that you cannot put spaces between apps or move them anywhere you want on the grid. Fortunately, for jailbreakers, there is a solution. Just purchase and install Gridlock ($2) from Cydia and you'll have the freedom to place icons anywhere you like. There are plenty of ways to customize your lock screen to make it look the way you want or offer additional functionality. Either way, you need to be jailbroken to do anything beyond changing your lock screen's wallpaper, so be sure to take care of that before proceeding with this section. Once they're installed, you can simply open Winterboard and apply them. If you want to make a custom theme, rather than use one that already exists, follow our complete guide on theming your iPhone's lock screen. If changing the look and feel of your lock screen isn't your primary goal, and you'd like to be more practical, you should check out IntelliscreenX ($10). Although iOS 5 is capable of providing a lot of information on your lock screen, this jailbreak app can do a bunch more. You can toggle settings (e.g. Airplane Mode, Bluetooth, Wi-Fi, etc. ), check the time, see RSS feeds, check the weather, look at your messages, and more. It's a really great app, but is a bit pricey at $10. It does offer a free trial, however, so you can check it out and see if it's worth your money. When you want to go all the way and completely change your iPhone's interface, you need to jailbreak and download DreamBoard (Free) from Cydia. It's customization abilities are nothing short of amazing. You can even make your iPhone look like it's running Mac OS X Lion or even Android. Although DreamBoard is a free app, some of the themes will cost money. Also, acquiring DreamBoard themes isn't always a simple process. While you can find some on Cydia, which are very easy to acquire and install, sometimes you'll need to use another application called Theme Outlet. You can acquire Theme Outline for free on Cydia, just like you'd get any other app, but using it can be kind of a pain if you're looking for something specific. It's less of an app and more of a web site masquerading as an app. Theme Outlet can be slow to use and won't remember where you left off if you ever close it. Despite these annoyances, it has the largest collection of Dreamboard themes and is often the only place to find some of the best (such as the OS X Ultimatum theme mentioned above). If you're looking for interesting themes to try, this is the app you'll want to use. When you buy a theme you'll receive installation instructions over email, as some themes require more work than others. Just follow those instructions and you'll be able to select your new theme in DreamBoard by simply opening the DreamBoard app and choosing it. One thing that's important to note with DreamBoard is that it makes some pretty hefty alterations. While you shouldn't run into issues, be sure to regularly back up your iPhone in case there's a problem. If something ever goes wrong and you end up with messed up system resources, you'll need to do a full restore to correct the problem and you'll want to have a backup ready. The iPhone is already one of the most beautiful gadgets you can buy. That said, its glass exterior is vulnerable to severe damage and, of course, is identical to millions of others. Here are a few unique ways to customize the exterior of your iPhone to personalize and protect it. You can always go out and buy one of the countless pre-made iPhone cases, but if you want to get a little more creative you can design one of your own. I did this for my iPhone 4 using Uncommon. Chances are you've seen some of their (very nice) pre-made cases in an Apple Store. For $35, they'll print your design on a minimal case to offer a unique look. I like Uncommon because I've had a good experience with their case—it's lasted me over a year so far, suffered a few drops, and my iPhone's in great condition. That said, you have some alternatives—many of which are less expensive. My favorite low-budget customized product printer is ArtsCow, who offers some of the weirdest custom-printed items you'd never consider. But they also print custom iPhone cases for only $17 and frequently offer discount and free shipping promotions. While I can't vouch for the quality of the cases, everything else I've gotten from them has held up over the years and the color accuracy of the printing wasn't too bad. As for services I haven't tried, you've got a few options that off their own unique benefits. Case-Mate provides image generators created by professional designers so you can create a unique case in a pre-defined style. (You can create custom options as well.) Zazzle has a larger variety of case types to choose from, but some of them cost as much as $40. Like Zazzle, unYOUsual provides a variety of case choices but at a slightly lower price print. GelaSkins offer a product that's very similar to what you'd get with Uncommon, but the cases look like they may offer a slimmer fit. Finally, Infectious offers cases at a lower price of $29 but only prints an image on the back (as opposed to one that wraps around the entire body). If you really want a highly-customized case, look no further than Etsy. Although their custom request forum (Alchemy) has been "resting" for almost a year, you can generally just search the site for custom iPhone cases and send a message to one of the sellers with your custom request. Many will be open to custom requests, seeing as it's pretty much a guaranteed paycheck. Finally, you can save a bunch of money by going the DIY route. As we've previously noted, you can print and fold your own iPhone case for just pennies, or make something a bit more reliable out of wool. Like the temporary tattoos of the iPhone world, skins are a nice way to add a custom design to your device without adding bulk or making an unchangeable commitment to any one look. An iPhone skin also offers some scratch protection, so it's not entirely cosmetic. While these skins won't protect your device in the event of a drop, preventing some scratches is still better than nothing. Skins are easy enough to find and buy from various web sites, but SkinIt allows you to design your own for $20. You can use any of their existing images as a starting point in their skin designer, or you can upload some of your own. The skin designer tool they provide will also let you customize your design with text and other elements, so you don't have to know how to use software like Photoshop (although we can teach you). SkinIt is just one of a few options available to you. You should also take a look at GelaSkins and Infectious for more options. Apple's most recent iPhones—the 4 and the 4S—are devices with a beautiful glass backs. Glass isn't exactly the most sturdy material, however, and you may also want a different look. Lucky for you, plenty of other options exist, from metal to wood to carbon fiber. If you'd prefer a nice metal backing similar to the original iPhone, this Metal iPhone 4 Cover will do the trick. If you're looking for a real wooden backing that completely replaces the glass (and are willing to pay a lot for it), JackBacks can provide both the product and the installation. Material6 offers a similarly pricey option, but with several unique wooden designs. Both Carbon Fiber Gear and Element Case can provide carbon fiber backings. Basically, you have plenty of options for changing up your iPhone's materials and its look. These are just a few examples, but chances are if you can think of another material you'd prefer to have on your device, you'll be able to find someone who's selling it after a quick web search. Got any other great great iPhone customizations we missed? Share ‘em in the comments!